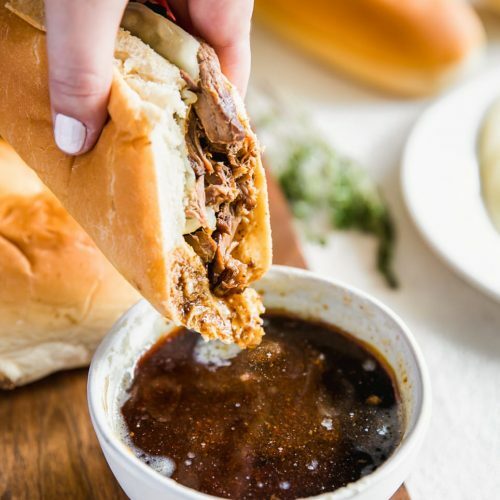 French Dip Sandwich, or French Dip Au Jus, is a delicious and easy way to enjoy crockpot beef! We create a Beef Au Jus sandwich with tender beef, provolone cheese, toasty bread, and of course the dipping sauce. Put beef roast into the crockpot. Sprinkle au jus mix and Itailian dressing mix onto the beef roast. Cover and cook on low for 6-8 hours or until beef is fork tender. After cooking, remove roast and strain broth into a bowl. Broth can be used for french dip sandwiches or for open faced roast been sandwiches. Slice roast beef in this slices. Place roast beef and provolone on hoagie buns. Wrap sandwiches and warm in oven for 10 minutes at 400F. Unwrap and enjoy! Use broth as dipping sauce.